The 18x24" Luxor Heavy-Duty Utility Cart (Gray) is a feature-filled, multi-purpose mobile cart with three large shelves for storage. With 4-4" casters (two locking), a flat middle shelf and 2-2 3/4" deep tubs, this utility cart provides easy movement and storage for all of your supplies. A push-handle is molded into the top shelf to ensure easy turns. The gray finish allows this cart to fit into any decor. The Luxor lifetime warranty is also included. The 2-2 3/4" deep tubs provide security for all of your stored supplies. The 18 x 24" size and 12" clearance of each shelf allows storage for many items. The locking 4" casters ensure quick and easy mobility. The neutral gray finish allows this utility cart to fit any decor. 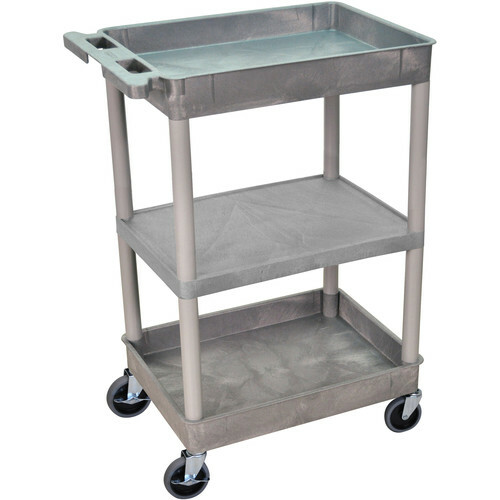 18x24" HD Utility Cart (Gray) is rated 5.0 out of 5 by 1. Rated 5 out of 5 by Amanda the office pro from Sturdy and functional We purchased this cart because we needed something solid that would fit into a small space. This cart fills both needs beautifully! We have outfitted it to be a cleaning cart for our breakroom and it not only holds everything and fits into the space we had left in the pantry, but it moves silently and everything stays put because of the high sides. I would definitely purchase again!